Frederic Leighton, Orpheus and Eurydice, 1864, Leighton House Museum. 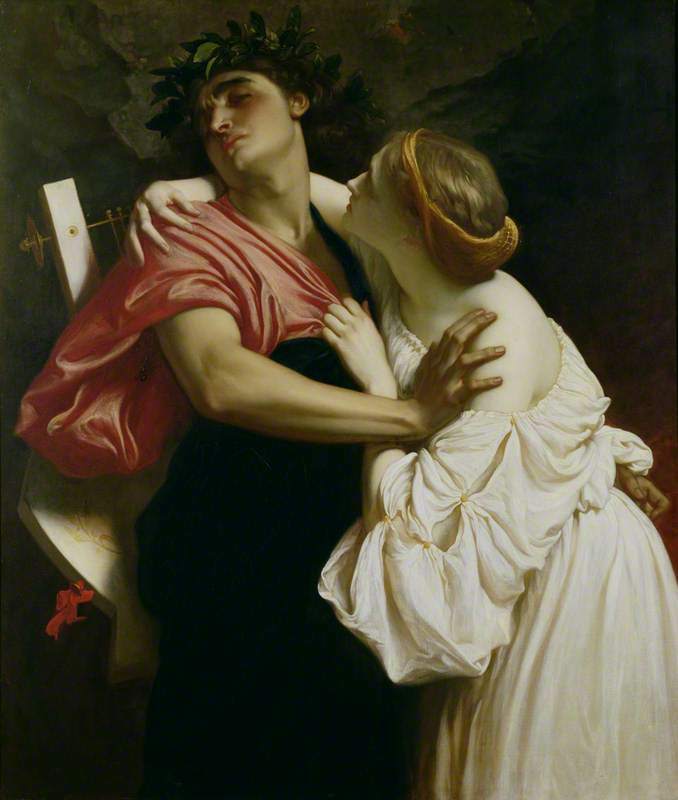 Looking at Frederic Leighton’s Orpheus and Eurydice c.1864 for the first time is a slightly confusing experience, and it helps to know the back-story. A condensed version of it goes something like this: Orpheus and Eurydice were a couple. Orpheus was a musician so talented that he could charm just about anything when he played his lyre. Eurydice was a beautiful nymph who died from a viper bite to the foot on the same day as her wedding. Stricken with grief, Orpheus played a melody so beautiful that it even softened the hearts of the underworld gods. They said he could retrieve Eurydice so long as he didn’t look at her on their way back to earth. Unfortunately Orpheus couldn’t resist a worried glimpse, and he lost his wife forever. So why in Leighton’s scene does Eurydice, whose shoulder of ivory flesh is exposed from a flowing white dress, appear to be some sort of temptress that Orpheus is desperately trying to resist? To understand this, we need poetry. More specifically, we need Ovid. He, enamoured, fearing lest she should flag and impatient to behold her, turned his eyes; and immediately she sank back again. She, hapless one! both stretching out her arms and struggling to be grasped and to grasp him, caught nothing but the fleeting air. And now, dying a second time, she did not at all complain of her husband; for why should she complain of being beloved? This passage from Metamorphoses not only describes the moment of disaster and all its scrabbling despair, it also shows us that Eurydice’s devotion to Orpheus was so strong that in her last moments, all she felt was love and concern for him. Leighton must have imagined the torment Orpheus would have felt, all of the guilt and grief, and decided that it was this moment that he wanted to bring to life. So when we look again at Leighton’s work, what do we see this time? It is not that Orpheus doesn’t want to look at Eurydice. It’s just that he can’t bare to. Perhaps he thinks the gods might forgive him the fleeting glance if he refuses to look at Eurydice again and resists her attempts at embrace, or perhaps he is just too overcome with grief about his mistake. Eurydice meanwhile knows her fate and is at peace with it. She tries to soothe her husband and hold him one last time. This was an unconventional take on the scene that had not been expressed through painting before. Works by Giovanni Burrini in 1697 and Christian Kratzenstein in 1806 show the initial moments after the catastrophe where Orpheus tries to cling on. It is only within Ary Scheffer’s creation from 1814 that we see anything from the moments afterwards, and may have provided some inspiration for Leighton. Perhaps aware that his scene was complicated and unorthodox in comparison to what had gone before, Leighton enlisted the help of his great friend Robert Browning. Browning provided a heartfelt verse for the piece, entitled Eurydice to Orpheus, that helps the viewer to understand the emotions that swept through Eurydice in her last moments. Defied,—no past is mine, no future: look at me! It is a fantastic example of Leighton’s willingness and successes in collaborating with the other great artists of his day, further exemplified in the creation of his home. Sadly, Browning’s poem was not enough to save Leighton’s Orpheus and Eurydice from criticism. It was the least popular of the eight works he displayed within the Royal Academy’s exhibition of 1864 and failed, in the eyes of the art world, to bring the classical subject to life. They didn’t take the time to consider that Leighton’s decision to be bold and stray from convention had actually achieved something special – an emotionally complex painting that gets to the very heart of true love.